The rains over the last few days have made for some wonderful waterfalls. 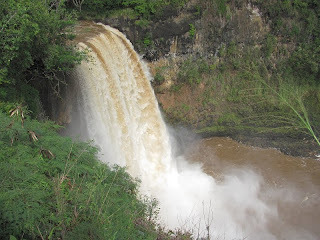 While part of the group is hiking on the Sleeping Giant, a few of us head up to Wailua Falls to watch the spectacle. This is the waterfall from the old Fantasy Island television series. Normally it's composed of two separate streams of gracefully falling water, but today, it's a raging cataract.